Nuthall Temple, so called from the domed roof, was built to the order of Sir Charles Sedley. The foundations were laid in 1754 and it was inhabited in 1757. It replaced an older building called Nut Hall, but is not on the same site. The idea of the Temple was taken from Palladio’s celebrated Villa Capra, near Vicenza in Italy, of which I can show you a photograph, and three other houses in England are built on the same model:— Chiswick House in Middlesex, Footscray Place and Mereworth Castle, both in Kent. Sir Charley Sedley was the second of that name of Nuthall, and represented Nottingham in Parliament in 1741, 1747, and 1774. 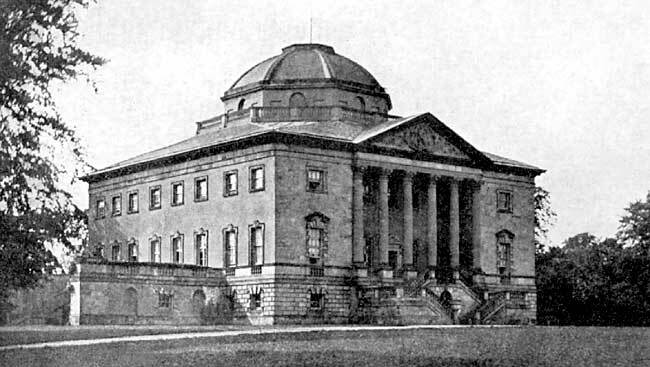 Tradition says that he built the house with the winnings of one race, which leads one to think that very large sums were wagered in those days, as I am told that Lord Falmouth, the builder of Mereworth Castle, paid the bills for his house up to £100,000, and then burnt the rest. From an old engraving we learn that the name of the architect of Nuthall Temple was T. Wright. The walls and ceiling of the octagonal domed hall are richly decorated with plaster work, wrought on the spot by Italian workmen. The festoons on the walls round the gallery are of four subjects: music, sport, science, and warfare, with replicas of each. The medallions in the centre of each festoon represent Aesop’s fables, and the goat’s head in a crown over each door is the crest of the Sedley family. The height of the dome is 58 feet. The length of the library is 60 feet and it contains about 4,500 volumes. The drawing room was decorated by the brothers Adams, and has beautiful panels of figures drawn to imitate Wedgewood. The pictures in the Temple were some of them removed from Darley Abbey, the Derbyshire residence of Mr. Holden before he bought Nuthall (the grandfather of the present owner) as, although the Holdens had been owners of property in Nottinghamshire since 1600, their chief residence had been in Derbyshire. 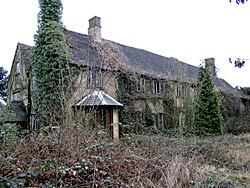 Hempshill Hall, overgrown and empty, in 2003.